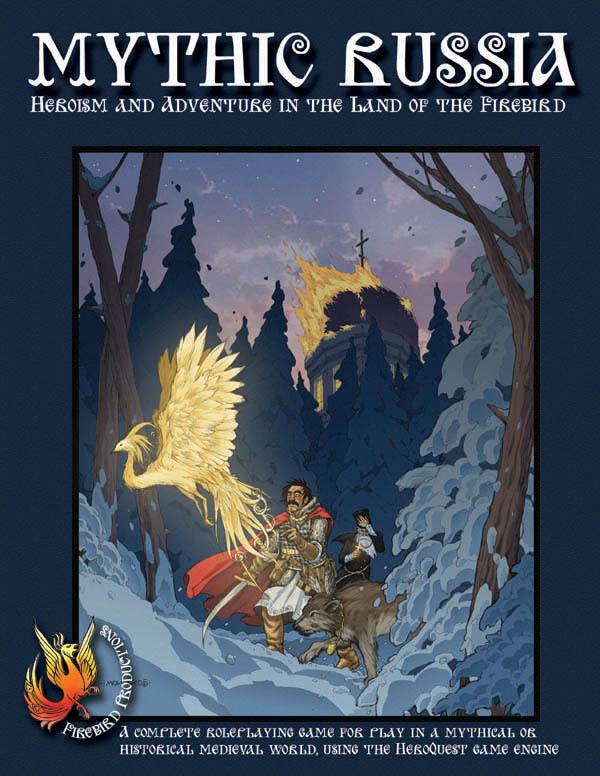 The Firebird sells his fine wares, both the core Mythic Russia rulebook and The Birchbark Chronicle supplements, in print-on-demand hardcopy and PDF formats through Lulu, here. The core Mythic Russia rulebook is once again available, at present as either 320-page softback or a PDF download – a hardcover version will follow. Handsomely illustrated, it contains all the rules you need, extensive and detailed background, a starter adventure and characters. A series of supplements for Mythic Russia that explore parts of the setting in greater depth, present adventures and scenario ideas and generally build on the core material. The steppe nomads of the Golden Horde under their Mongol overlords have built a mighty empire, stretching across Asia and into the lands of the Rus’. This companion to the Mythic Russia roleplaying game reveals more about the past conquests of the Golden Horde, its present peoples (including a full guide to the Bashkorts, one of the constituent peoples of the Horde) and its future troubles. 60 pages, softback; includes maps, story seeds and a scenario. As an experiment, available in both full-colour and black & white versions, and also PDF download. [to follow] Full-colour, perfect-bound version. Saddle-stitched version with black & white interior pages. The best thing to do is use the Contacts tab on the blog site. Thanks!